Death,Rebirth and a promise from the future. Little Meiko meets the Brits. Ruki never liked Nova and now she liked the blonde digidestined even less. ” AND WHY SHOULD I GIVE ANY EXPLANATIONS TO THE SO CALLED QUEEN OF DIGIMONS? ” berated Nova, quite pissed off ” It´s fine if you dislike me, I 100% dislike you even more! The girls stared at them and Taichi realized he could never be considered the digidestined of Courage anymore the minute he looked at their faces…the girls were much like tigresses, ready to eat them alive! “Ok…go on” he mumbled, completely terrified. World War III would have begun had not Ryo Akiyama arrived at that moment. Digimon Infinity has its own Facebook page! I was commissioned to draw this adorable digi-lady by Avdermisprime, her name is Uzumemon. 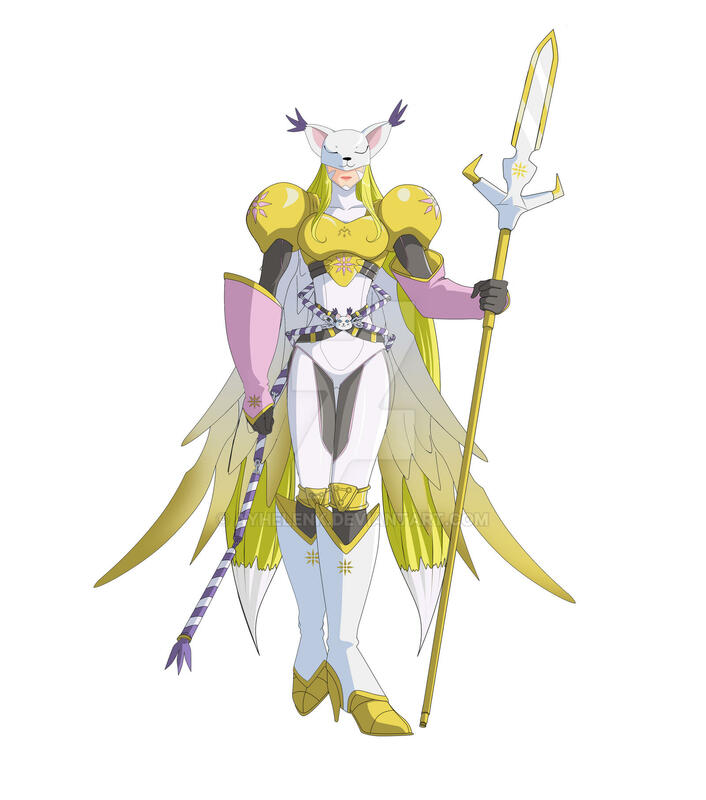 While she belongs to the Sakuyamon-family, Uzume-chan actually comes from the Gatomon evolution line. I had fun drawing Uzume-chan, that’s for sure. A belated piccie for Valentine Day, here’s a fun scene from the reality 12 version of Sorato and the unexpected third party in discord. Much to everybody’s surprise, Sora Takenouchi and Miyako Ishida decided to give it a go and became a couple. Tia and the others wondered how two souls that apparently had nothing in common , he, a biker and feared streetfighter while she, supposedly married to her cello for life managed to hit it off let alone dating. But nobody was as shocked (and annoyed) as Sora-kun’s digimon, the usually dotey-cutey Piyomon. If in the past Miyako had to bear with the bad temper of a brocon nutso named Nova who mistakenly believed she was dating her beloved ikemen older brother Magnus, Nova’s brattness was like a pile of feathers compared to Piyomon´s! At the early stages of their relationship as boyfriend and girlfriend, the digimon would make sure to act as a proper bodyguard. For example, the other Sunday Sora wanted to take Miyako for a ride in his brand new bike.While never being a fan of motorbikes, Miyako was actually looking forward to the ride as she always enjoyed watching him riding that stuff and challenging other bikers. And he was sooo manly like that! “WHAT THE HELL IS THAT? !” yelled Miyako as Sora-kun did not make it alone to the date. ” I AM NOT GOING ON A DATE WITH YOUR DIGIMON!” exclaimed Miyako , already fuming. If in reality 01 Yamato Ishida had it easy being a chicks’ magnet, reality 12 Sora Takenouchi had it easier. In the end, to prevent the beginning of World War IV, Sora parked the bike and invited the antagonists to eat an ice-cream…. As many may have noted, the main characters had been on private mode for a while hence unreadable. Gomen! I just needed to do it . I wanted to correct some inconsistencies in the plot as, I’m afraid, there were moments that were a bit messy and needed to be fixed. For now, I re-uploaded the prologue and chapter 1, soon followed by chapter 2 and 3. I also an extra chapter “Introduction” in which everybody can have a squint about the different realities and their characters before diving into the main adventure. I wish everybody a belated merry christmas and may the 2019 be a wonderful year for you!